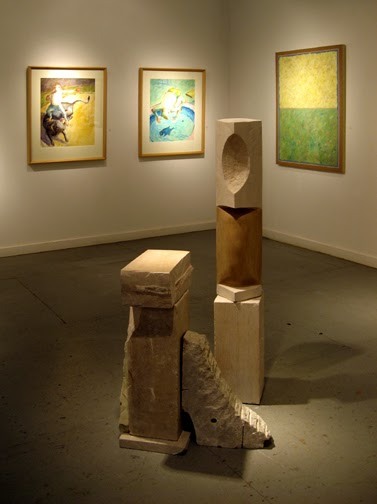 Vista Studio stone carver Sharon Licata was one of nine sculptors selected for the prestigious 22nd Rosen Outdoor Sculpture Competition and Exhibition. Above is one of the images from the 36-page, full color catalog depicting Sharon’s installation. The catalogs are available on request. To me Art is a verb. No matter what medium, realistic or abstract subject matter, my art has at it’s heart, motion; the curves and twists of searching and of reaching upward. Sharon is a graduate of Agnes Scott College with a B.A. in Art and Political Science, and USC with a Masters of Media Arts. A sculptor of both realistic and abstract form, Sharon works in a variety of media: stone, clay, and formed stone. Her sculptures are in numerous private and corporate collections as she has shown in many parts of the country. When not in the studio, she can usually be found teaching statewide as a “Visiting Artist” for the SC Arts Commission. Above and below are detail images of the piece. Getting Back on the Totem debuted at Gallery 80808/Vista Studios during the annual, autumn Vista Lights exhibition, 2007. Below is an image of the sculpture during that earlier art event.